From a critically acclaimed, environmentally conscious airport project to the renovation of a national treasure that plays host to astronauts and space-flight enthusiasts, the winners of the 18th Annual Starnet Design Awards had judges and competitors seeing stars. Starnet® Worldwide’s annual flooring design competition recognizes creativity, professionalism, quality and versatility, and this year’s winners encapsulated the power of innovative and bold flooring installation in commercial interior design. The winners were announced on April 15, 2016 in Miami, FL during Starnet Worldwide Commercial Flooring Partnership’s Annual Meeting, April 14-16. Gold, silver and bronze prizes were awarded in six judged categories: Healthcare, Corporate, Education, Hospitality/Public Space, Environmental Achievement and Unique Installation Challenge. Votes from Starnet Members, Vendor Partners and members of the trade press selected the winners of the third annual People’s Choice Awards. The most prestigious award, the 2016 Grand Prize, was presented to Resource Colorado of Denver, CO for its work at IMM TI. The installation at the Boulder, CO-based digital agency also captured the Gold in Corporate. “The entire team is honored to win both Gold in Corporate and the Grand Prize at the 2016 Starnet Design Awards,” said John Stanfield, Owner of Resource Colorado. “This project allowed us to flex our design and installation muscles and create a space that supported IMM’s staff and exuded their branding. The finished product represents our original mission for the building: revitalization, productivity and identity,” he added. IMM TI is a brand driven by data, digital technology, and culture. The full-service agency needed a space that reflected its personality as a forward-thinking, modern, and youthful company but also provided a zen-like balance through the integration of greenery and blend of interior and exterior design elements. This project was selected as a winner because of the balanced combination of materials that resulted from this vision, along a well-edited approach. “The project is a great accomplishment, with woven elements and a unified final design,” said Design Awards Judge Scott MacMeekin. The overall aesthetic was an industrial, neutral palette to which the flooring team added pops of color in the carpet, the greenery, and specific paint locations in order to align with the client’s professional but playful persona. A variety of collaborative and individual workspaces were integrated into the plan to support a range of staff work styles. 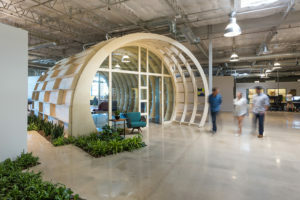 Built-in “nooks,” standing height touchdown spaces and informal “living room” style meeting areas were all key factors in designing for company productivity, flexibility, and staff satisfaction. 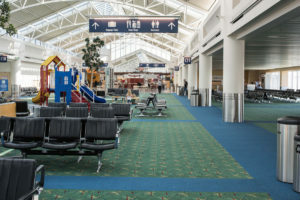 The Gold in Environmental Achievement was awarded to Rubenstein’s Contract Carpets LLC for its work on the Portland International Airport (PDX) Terminal Recarpeting. The project, which gained national attention through coverage in the Wall Street Journal, Smithsonian, New York Times, and on NBC Nightly News, was done over 10 months in a fully operational airport. It saw the complete removal, reclamation, and replacement of 14 acres of carpeting, in an airport that was known for its iconic carpet pattern. The environmental story at the Portland Airport goes beyond recycled content, sustainability, and LEED points. This project was all about the direct reuse of 14 acres of used carpet, without additional processing and direct recycling into carpet pad. Rubenstein’s Contract Carpets LLC was able to re-purpose and upcycle many of the products into entry mats, area rugs, wall art, Christmas ornaments, community center carpet, flooring for a renovated a 100-year-old building, baseball practice hitting facility, etc. In addition, the company recycled the balance of the material into a variety of materials, and all scraps of the new carpet (in excess of two feet) were saved and have been given to a vendor to make entry mats and area rugs for resale. Moving into a new home is an exciting time. It also requires a seemingly endless amount of planning and preparation. Moving day serves as the culmination of much hard work. While the moment is often a thrilling one, it is extremely important to protect your hardwood flooring during this process. The Hardwood Flooring Store wants homeowners with hardwood floors in Toronto to know these basic tips for moving into a new home. Before you move all of your belongings into your new place, it is important to assess the condition of your floors. It is much easier to do any necessary cleaning or reconditioning prior to the move. In many cases, the previous owners of the home may have updated the flooring before the house was sold. If this is the case, some simple cleaning is all that will be required. For bigger sanding and refinishing projects, contact a hardwood flooring expert in Toronto. Use a wood-cleaning product that is diluted according to the instructions on the label. Always test a small area prior to using it on the entire floor. Damp mop the floor with the cleaner, avoiding any standing water on the surface. Rinse with clean water according to the directions on the cleaning product. Using a fan or air conditioner will help to speed the drying process and prevent moisture problems. Remove any marks by buffing the surface with a clean, soft cloth. Do not use harsh scrubbing implements that will damage the hard finish. Scratches and dings are not inevitable. They can easily be prevented by taking some basic steps. If you are using a moving company, it is essential to discuss their prevention methods for protecting hardwood floors. They should be able to articulate a strategy for keeping your floors flawless. Take pictures of the floors prior to the movers arriving. This will protect you in case you need to make a claim for damages. For do-it-yourself movers, you will need to be prepared in advance with the right tools to protect your wood floor. Use padding and glides to move heavy furniture. Always check for debris under the padding prior to sliding it on the floor. Hand trucks are essential for moving large items like refrigerators or other kitchen appliances. These can damage your floor if they don’t have the right kind of wheels. Never use hard wheel hand trucks, such as hard rubber or plastic. These can scratch the surface. Always check the wheels for small rocks before loading. The owner advises purchasing temporary floor protection rolls. These can be rolled out over the entire surface of the flooring. They are frequently used by contractors during remodeling or building. They provide an additional layer of protection from the elements including water and mud. Selecting the perfect floor for your home can be difficult, given the increasing number of options in the market today. With choices ranging from real wood and carpet to ceramic and vinyl, making an informed decision on a suitable floor covering is often complicated and confusing for the homeowner. Design experts from Karndean Designflooring explain the benefits and drawbacks of different surfaces in this article. Real wood floors are strikingly beautiful when freshly laid; however, they can quickly lose their appeal if regular maintenance is not done. Karndean Designflooring recommends Luxury Vinyl Tiles (LVT) as an excellent alternative; with their realistic textured wood and stone designs, they don’t need sanding or refinishing, requiring just a quick ‘refresh’ every 6-12 months. There are beautiful timber varieties that aren’t suitable for flooring applications as they are soft woods, and therefore easily damaged. 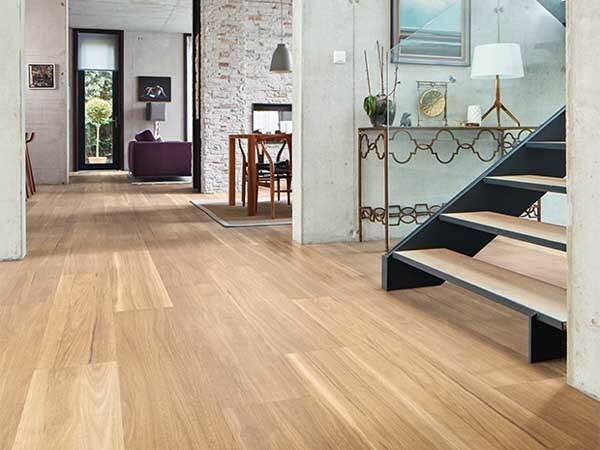 Karndean’s flooring comes with all the visual appeal of these coveted soft woods without their practical limitations. Though laminate flooring is cost-effective and easily accessible in DIY stores around the country, it is highly susceptible to damage. For instance, the lack of waterproof resistance in laminate flooring can result in warping and splitting. Floors from Karndean Designflooring are completely waterproof, making them ideal for kitchens and bathrooms. Carpets may evoke a comfortable vibe but are storehouses of dirt and allergens that are practically impossible to banish. Luxury Vinyl Tiles offer a much more hygienic flooring solution while still providing more warmth than laminate, real wood and stone options. The brand new Karndean LooseLay Longboard collection is easy to maintain, durable, waterproof and hygienic, with a huge range of designs to suit all styles. Key benefits also include quick and easy installation with the stylish, extra-large 1.5m long planks minimising the hassle; significant reduction in noise transfer to the rooms below, making them perfect for bedrooms and apartments; easy replacement of planks; and convenient access to underfloor services as the planks can be easily lifted. The home is at the center of it all during the holidays and your floors experience heavy traffic by visiting loved ones. They are the home’s greatest canvas yet often overlooked and undervalued. Replacing your hardwood floors can be an expensive and time-consuming investment, but refinishing them will restore the richness and elegance of the wood. Thanks to Minwax® Complete 1-Step Floor Finish, a two-in-one stain and protective finish, refinishing floors can be done with ease. Unlike traditional hardwood floor finishes, Complete 1-Step Floor Finish saves time by eliminating extra steps and the need for multiple products to stain and protect the floor. It provides superior durability and requires no sanding between coats. It can be used on bare wood or over an existing polyurethane finish – allowing you to change the color of your floor without sanding down to bare wood! After preparing your floor, apply Complete 1-Step Floor Finish in your choice of five natural wood tones. It also come in two sheens—gloss and satin. Your application tools can be cleaned up easily with soap and water. Minwax® Complete 1-Step Floor Finish is available at local home centers or hardware stores.